You'll learn how to recognize the powerful messages you're receiving through your intuition - one of the keys to getting answers to your prayers. This valuable tool is life-changing when you can act on it in confidence. Whatever you're experiencing in your life, my hope is that you will thrive & rise to your fullest potential - especially if you find yourself in the midst of challenging circumstances. I've shared this video as my gift to you - because I know your experience can be richer & more fulfilling by learning to have more intimate communication with the Source of your greatest strength, the Source of All Love. I'll show you some of the reasons why the practice of prayer can change your life dramatically. And why you don't have to be "religious" to benefit from this powerful tool. 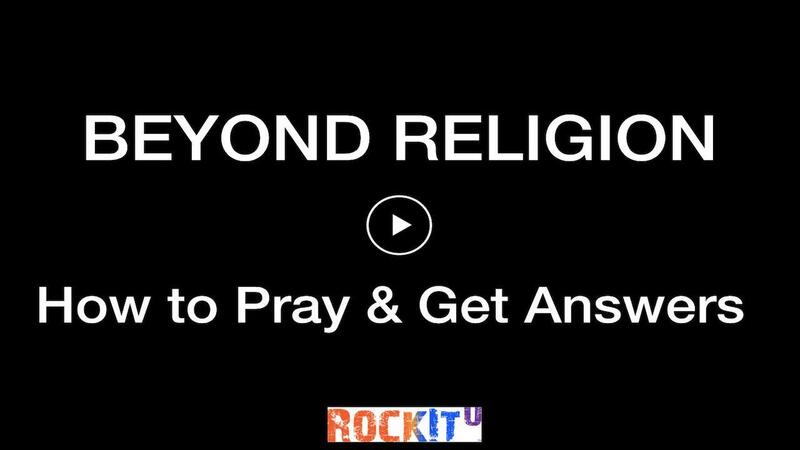 This video is part of the 8-lesson course BEYOND RELIGION: How to Pray & Get Answers. The lessons will show you how you can experience the magnificent benefits of prayer. It will show you how to get answers to your most pressing questions & difficult life challenges. And most importantly, how to bring more love & joy into your life. You're receiving access to this video, as my gift, because I've had some very rough times myself & I know what has helped me the most. I want to pass that same kind of support & healing on to you. - Why beyond religion? Isn't prayer a religious thing? - What if I don't believe in a higher power? - What is prayer anyway? Is it something I can do easily & benefit? - Is it really possible to ask & receive answers? • Video 2: Why Pray? - What's the point & what am I praying to anyway? - I don't want to "get religious". I'm more into science & proof. Can I pray & still be me? - Will prayer really help me achieve the things I desire? - I'm already extremely busy. How can I take on the additional time prayer seems to require? - Isn't prayer just asking for help when I'm down or in trouble? What else could it be? - Is there a better way to get answers to my questions & prayers? - I've never felt comfortable with the prayers I've heard in a church or from other people. It just isn't the way I communicate. Is there another way? - Prayer seems too complicated. Can it be simpler? - Prayer is kind of a mysterious thing to me. How can I explore that mystery? - Does walking in the mountains or on the beach count as prayer? - Are there special prayers for achieving greater things - like healing? - You mean I can actually hear answers coming back to me? - How do I know if I'm getting a communication or answer to my prayer? - What does it sound like or feel like? - I'm just a "regular" person. Isn't "hearing God" just for superheroes, saints or crazy people? - How do I get past all the distractions when I try to get quiet & pray? - How do I pray when I just don't feel like it's working? - Where & when should I pray? I don't have time to go to a church or other sacred site on a regular basis. - How does my body play a part in getting answers to prayers? Isn't this just a spiritual thing? - Is it just my own imagination - or is that thought really an answer to a prayer? - Can I train myself to become more intuitive? - What happens when my intuition seems to be telling me something different than what I would like or would have imagined? - Do miracles really occur these days? - Aren't miracles really big things that happen to people who are more spiritual? - Is it possible for me to learn how to witness miracles? - Is love more than just an emotion that changes with my feelings? Is it really something more powerful than I've imagined? And can I intentionally use it to bring about miracles in my own life & the lives of others? The time to take advantage of these life-changing lessons is now! Are you hurting? Would you like to make significant changes in your life, but just don't know how to create a shift in your circumstances? Or would you just like to further explore your spiritual side? Give yourself (or a loved one) a life-changing gift with this video course. The point is to create more Love in our lives! And there are ways to do exactly that - no matter what circumstances you encounter. Whatever you're circumstance at the moment, I pray you rise to more joy & fulfillment. P.S. If, after you've watched the videos, you're not satisfied & you feel like I didn't give you any new tools for creating more love, joy & fulfillment in your life, I will refund the purchase price in full - no worries, no questions asked. Just let me know within 30 days of purchase. All bonus videos & music soundtrack downloads will be available after the 30-day guarantee period. Peace. Get More Love in Your Life With Powerful, Yet Simple Tools! Get out of boredom, loneliness, frustration & fear. It's time to thrive! Experience more success, fulfillment, & joy in every area of your life. And most importantly...experience more love. This course will show you how.